Former Arkansas Governor and potential 2012 presidential candidate Mike Huckabee recently released a statement explaining his comments he made earlier this week about actress Natalie Portman and her “glamorizing” unwed pregnancy. Huckabee made the comments when discussing his new book, A Simple Government. The first chapter of his book is about the importance of a traditional family structure that includes a father, mother, and children. 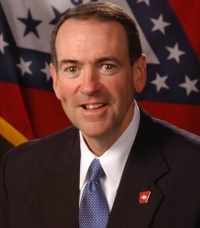 Huckabee stated that he thinks it is unfortunate that society is glorifying and glamorizing the notion of having children out of wedlock when the reality is that most single mothers are poor, under-educated, and unable to find stable employment. Huckabee used Portman’s situation, she is expecting a child out of wedlock with Benjamin Millepied, as an example of how society glamorizes these situations. He later went on to say that his comments about Portman were not meant as a “slam” or “attack,” but rather just a specific instance that supports his argument. The comments about Portman, and the backlash they have received, have been part of a tumultuous week for the aspiring presidential candidate. Earlier in the week Huckabee received criticism for remarks questioning President Obama’s childhood and comments comparing abortion to slavery.